Tony Iommi says it’s “possible” that Black Sabbath could record another album and make festival appearances after their farewell tour finishes. The metal icons’ The End trek will be completed with two shows in their home city of Birmingham on February 2 and 4, bringing their career on the road to an end after 49 years of action. One of the main reasons for calling a halt is the guitarist’s health concerns after his battle against cancer. Iommi tells Talk Is Jericho: “It’s going be such a weird thing because Black Sabbath’s always been my life. “Everything fell by the wayside to Black Sabbath – all the marriages and everything, because I’m always out working and always doing this, always in the studio. “It’s going be pretty weird, that last show. I don’t know how anybody’s going to feel. And after that, who knows? “I’ve been asked, ‘What are you going to do after this?’ Well, I don’t know. As long as it’s not world touring, I’m all right. He adds: “I don’t want to stop playing. For me, it’s the touring now. There’s a day when you’ve got to go, ‘Look, we’ve done it for almost 50 years. It’s time to re-look at it. Ozzy: "With Black Sabbath Nothing Is Ever Easy. It’s Never Been Easy"
Tony Iommi: "Some Nights I'd Do Two Or Three Grams Of Coke"
“When I got ill, that’s when I started getting vulnerable. Before that I could do anything – but I suddenly felt deflated and lost a lot of confidence. “They’re going, ‘You shouldn’t be flying, really. You shouldn’t be doing this, you shouldn’t be doing that. 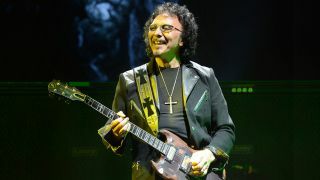 Asked about the chance of festival appearances in the future, Iommi says: “I wouldn’t write that off, if one day that came about. That’s possible. The Black Sabbath Lyrics Quiz: can you match the line to the song?